I’m going to apologize in advance for the slew of RESP posts that I’m planning to unleash on the blog. 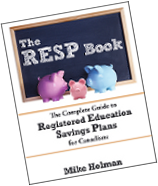 I’ve been working on the 2nd edition of The RESP Book and what started as fixing up a few typos ended up being a bit of a rewrite with a lot of new material. Fear not if you bought the first book – all the new material will be published on the blog and there will be a “change page” so you can see all the changes I made. My plan is to redo the book and then release in Kindle format as well. I’m also going to create a smaller e-book which will just cover the withdrawal phase of the RESP. Andrew Hallam reflects on his post-cancer perspective. Great read. Ken Jennings writes some funny stuff about the man on the moon. Barrie McKenna says that Newfoundland is a “have” province, but is still getting the perks of a “have-not” province. Krystal from GMBMFB breaks down her new mortgage and budget for us. Krystal is about as good a cash manager as anyone I’ve ever seen. She has a decent paying job, she works various part time jobs and freelance gigs to make extra money. She manages to save a lot of money and most importantly, she spends money on things that matter to her. She doesn’t seem to have any waste in her budget. Larry MacDonald had a really good piece asking if house prices are going to tumble. Some of the indicators used by real estate bears might be flawed. A Loonie Saved writes about the incredible benefits of house ownership. The Holy Potato wrote some good instructions on how to get the TD e-series index funds. They’re a great deal, but you have to work for it. Explore for a year interviewed someone who is traveling the world with his 9-year old. John Warrillow of the Globe and Mail says that if you want to hire entrepreneurs – screen out the MBAs. I would think successful entrepreneurs wouldn’t be applying for many jobs. Rob Carrick makes a great case for investing in international markets. Dianne Nice from the Globe & Mail wrote about teaching your chicks how to build a nest egg. Young & Thrifty wrote an excellent post about planning for advanced care if you have elderly relatives. Worth a read. Sherl Smolkin from Moneyville describes the “grandparents scam“. Pretty interesting. Boomer and Echo explains how to assess your estate plan. Canadian Capitalist doesn’t like Garth Turner’s dodgy advice. Michael James says that some investors have misconceptions about investing. Turns out that Michael had one of his own. Million Dollar Journey wrote about stock chart patterns. Do I Get a Tax Deduction on Home Sale Loss? — Selling your house for a profit can trigger a capital gain, but what about selling it at a loss? Thanks for the mention! Whaddya know, you found another way to get me read your site! I definitely second your assessment of Krystal’s money management skills, she has a plan for every penny which includes some fun stuff too. And the Advance Health Care post on Young and Thrifty was really good as well. Shows that these so-called young bloggers are not just great resources for gen Y’s but they’re good reads for everyone looking to improve their finances. Thanks for mentioning Boomer’s post on estate planning. Out of curiousity, what do you mean by “in Kindle format”? Do you mean specifically for the Kindle; or a generic e-reader format compatible with many types of e-readers and e-reader software? Other than that I’m looking forward to the new chapters! @Schultzer – I don’t really know what I mean (or what I’m talking about) when it comes to ebooks. I know that Amazon offers books for Kindle – not sure if they offer other formats as well? I will look into other formats later on, but the Kindle will be the first attempt. I’d be interested to learn more about the process of publishing a book electronically. Maybe that would make a good future post. Thanks for the mention. @Michael – I’ve written a few posts on the process over at blogthority.com. This posts links to all of them as well as a download of a awesome book (which I didn’t write) if you are really interested. Thanks for the mention Mike. Good luck with the new book. @schultzter: Amazon uses its own proprietary format called .mobi. Your book will have DRM but if it didn’t you can freely convert to another ebook format such as epub (used by Kobo and other readers) using a tool such as Calibre. Your book, unfortunately, can only be read on Kindle. @Mike: Thanks for the pointer. I’ll have a read. Thanks for the mention, Mike. You can just call me Potato. Hey Mike 🙂 Thanks for the mention! I liked my post too on advanced planning care, though I’m sure it’s not a popular subject to talk about let alone read about- I’m glad you liked it. Interesting article about Newfoundland. I have family originally from Ireland living there and have long imagined moving out east myself, but any (admittedly quite superficial) research of the job market in our respective fields the husband and I have done hasn’t looked good.